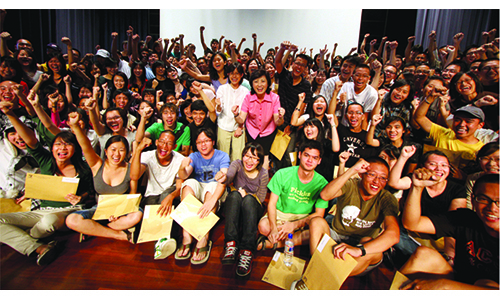 HINGHWA METHODIST CHURCH (HMC) and the People’s Association Staﬀ Club (PASC) raised more than $100,000 for the needy in the Lavender community with a jointly-organised charity walk on Sept 3, 2011. 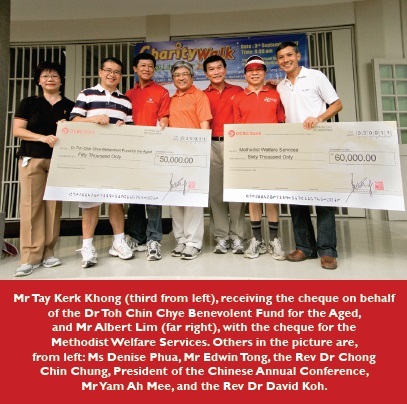 At the cheque presentation ceremony, the Rev Dr David Koh, Pastor-in-Charge of HMC, announced that a total of $119,825 had been raised – $67,580 going to the Methodist Welfare Services (MWS) for D’Joy Children’s Centre and $52,245 to the Dr Toh Chin Chye Benevolent Fund for the Aged. 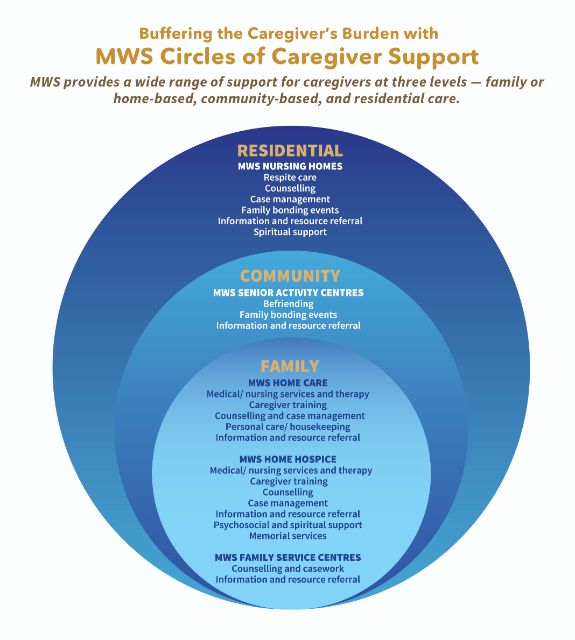 D’Joy Children’s Centre is a joint community outreach programme of the MWS and HMC that oﬀers before- and after-school care services to children aged two to 12 years from underprivileged families. e Dr Toh Chin Chye Benevolent Fund for the Aged aims to help provide for the financial and medical needs of the elderly, poor and destitute in the Kampong Glam constituency. 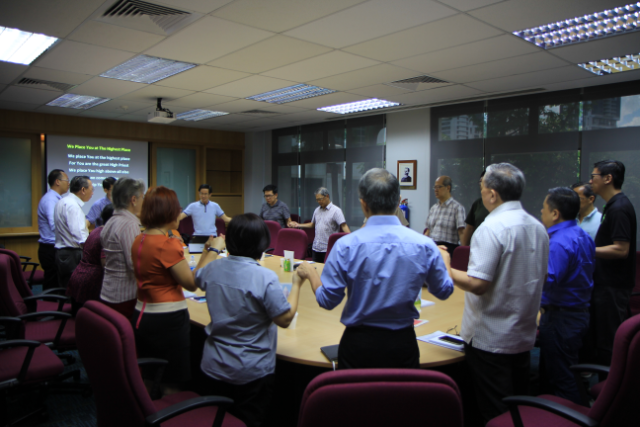 For several weeks before the actual event, members of HMC and its outreach ministry, Yishun Methodist Mission (YMM), together with members of the PASC and grassroots members of the Moulmein-Kallang GRC, went about raising funds through donation cards and collecting direct donations. These public-spirited eﬀorts culminated in the charity walk on Sept 3 that sought to demonstrate the participants’ love and care for the community. About 750 members from HMC, YMM, the PASC and grassroots organisations from the Moulmein-Kallang GRC, gathered early at the Kitchener Green playground. They were greeted by energetic helpers from the young adults’ section of HMC as well as Girl Guides who handed out souvenirs and bottled water to the participants. 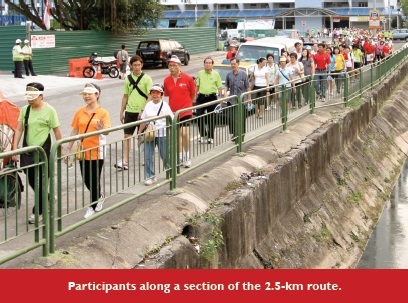 After a few minutes of warm-up exercises, the enthusiastic crowd was flagged oﬀ for the walk by the Guest-of -Honour, Ms Denise Phua, MP and Adviser to Kampong Glam Grassroots Organisations. 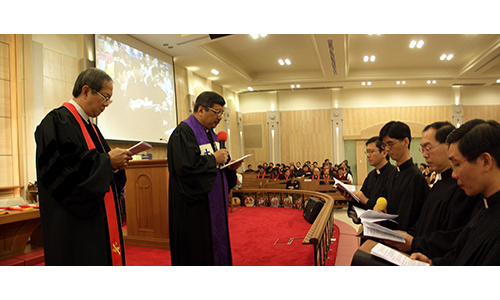 She was accompanied by these special guests – Mr Edwin Tong, MP and Adviser to Jalan Besar Grassroots Organisations; the Rev Dr Chong Chin Chung, President of the Chinese Annual Conference of e Methodist Church in Singapore; and Mr Yam Ah Mee, Chief Executive Director of the People’s Association of Singapore. In high spirits and blessed with fine weather, the participants began their 2.5-km walk, passing familiar landmarks in the community, such as the flea market in Kelantan Road and the Immigration and Checkpoints Authority (ICA) Building. They were guided along the way by members of The Boys’ Brigade who manned the road junctions. Members of the St John Ambulance Brigade were also on hand to assist. The walk ended in the compound of the People’s Association Headquarters at King George’s Avenue, next to the church where participants were greeted by rows of cars with their boots filled with goodies for sale. The proceeds of the sale went to yet another charitable cause – Chair for a Cause @ Chingay Parade 2011, which brings the joy of the Chingay Parade to underprivileged groups in the community. The event ended on a high note with the Guest-of-Honour and special guests doing their bit for charity as well. 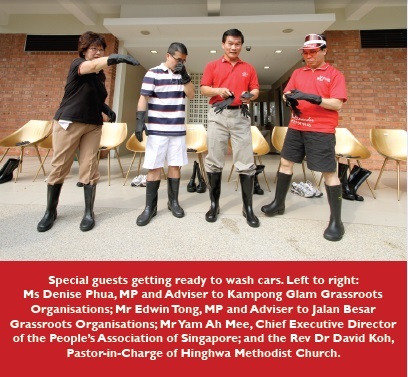 They gamely put on wellington boots and rubber gloves and participated in a car-wash event. Lee Woon Kee is the Chairman of the Charity Walk Organising Committee in Hinghwa Methodist Church.